I will freely admit that I have always been a sucker for the strange and bizarre. As a child, I was hooked by ghost stories, legends and places with interesting tales associated with them. Whenever I travel now I find myself with the same fascination, often visiting slightly off kilter – or downright crazy – places on a whim. One of my favorite activities is speaking to locals to find out about local legendary hot spots for weirdness. For the sake of this hobby of mine, I am always on the lookout for weird websites associated with travel. They are always great for inspiration, and sometimes just fun. Not to mention a couple that have been genuinely informative and helped me along the way. Here are five of my favorites from my own bookmarks. This is a full travel website with guides, deals, ideas for trips and more. But it is also a place where you can learn of the (supposed) wisdom of the stars. 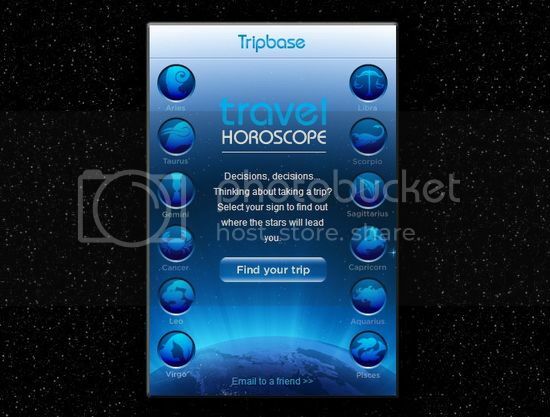 Using their travel horoscope feature, find out what the planetary alignments have to say about an upcoming trip, or help you plan one. Every month it updates, giving you little tidbits like whether to travel alone or with friends, whether to keep it cheap or go wild and more. Not to everyone’s taste, and certainly not reliable, but still a lot of fun. We have all been there; you are supposed to take a connecting flight that stops halfway. The other flight is too far off to just kill time, but not long enough that you want to spend more money paying for a room for the night. This is usually the dreaded 12 – 14 hour window problem that are especially common with international flights. Don’t take it too hard, just find out the ‘proper’ way to sleep in an airport. Search specific airports to learn about any potential hazards, read their tips for sleeping safe and sound, find out about features like cots and lounges and more. You can even read stories of other travelers who have done the same. Do you ever wish you could pay for trips with your looks. Well, now you can. This site connects attractive people with generous travelers who are looking for a companion on a trip. Sounds a little shady, I know. But the site is supposed to be well checked, heavily monitored and safe. They acknowledge the risk involved in meeting a person online, and try to fight against any potential harm while showing their members how to do the same. You might be able to make a few interesting connections here, though I have to admit I have never done more than browse it out of curiosity. I have ended up on so many impromptu road trips thanks to this awesome site. It lists various places around America where roadside attractions reign supreme. Some of the places really are bizarre, some macabre or morbid, but all pretty cool. Wanna go on a swamp tour? See a mummified body? Go to a voodoo museum? See a whole lot of tanks? America has all that and more, and probably quite a few things within driving distance of your home. This is another site listing odd places to visit. But it is global, and goes further into the esoteric and mysterious, rather than the freakish. I have learned about so many weird places I never would have otherwise heard of. Not to mention was able to plan a couple of stops during a recent international trip that made it all much more interesting.